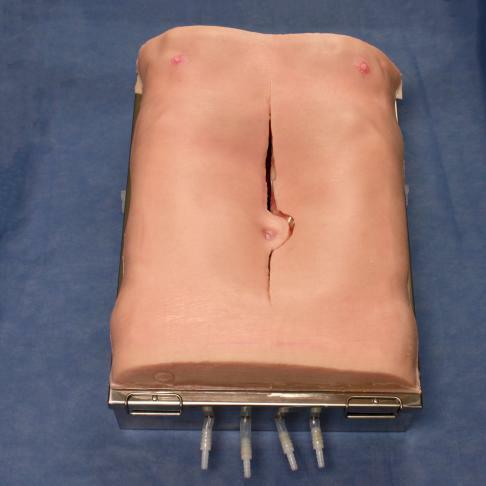 The AAA Abdomen Simulator consists of a male size torso with the right anatomy to plug in an AAA model and a pulsatile pump to provide a very realistic training scenario. The trainee can be trained on all steps of an Abdominal Aortic Aneurism procedure, access the Abdominal Aortic Aneurysm, utilize all the surgical tools and repair the aneurysm at the right angles, and then use the pulsatile pump to check for the quality of the repair. Excellent for Abdominal Aneurysm open repair using all the anatomy and proper angles to practice the usage of all vascular instruments and techniques to access, cut, clamp, suture the graph and repair the aneurism. The Abdomen comes with a pulsatile pump to evaluate the quality of the repair. Realistic human torso at the proper angle. Practice usage of all vascular instruments to access, cut, clamp, suture, graph and repair the aneurysm. Pulsatile pump is included and useful to evaluate the quality of the repair. 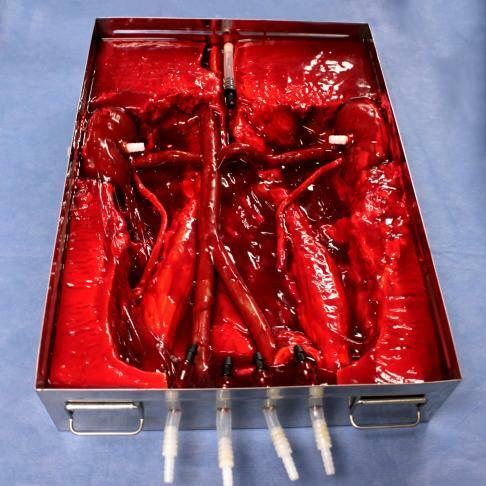 This product includes a male-sized torso with an incision in the middle as well as a LifeLike Abdominal Aortic Aneurysm (AAA) model to be inserted into the simulator. The abdomen simulator is mounted on two platforms. The top platform includes the skin with middle incision and the bottom platform houses the internal human anatomy where the AAA can be positioned. This product also comes with a pulsatile pump to check the quality of the aortic repair. Weight is 5 kg approximately, 54 cm X 35 cm x 15 cm. Manufacturer – LifeLike BioTissue, Items 1206, 1221, 1222. Price: Regular $5,612.25, With Bowels $6,326.25, Additional Abdomen Bowels for Simulator $714, No pump, no tissues - $5,013.75.